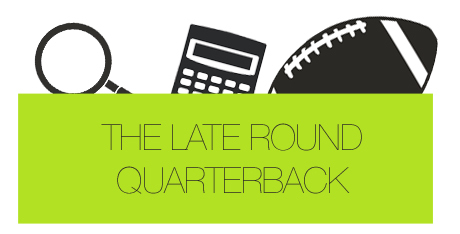 The Late Round Quarterback staff put together their running back rankings for the 2013 season. The following rankings are based on standard scoring in redraft leagues, where each touchdown is worth six points and one point is rewarded for every 10 rushing or receiving yards. There was absolutely no variance in the staff’s top running back choice. It’s Adrian Peterson, just like it should be. The first considerable variance in the rankings, really, came with Jamaal Charles. Austan Kas penciled Charles in his list at number 9, while no other writer ranked him worse than number 4. I love JC of KC this year. He’s in line to get a ton of work – especially in the passing game – and should have no problem finishing as a top-5 fantasy back. Another running back I love this year is Marshawn Lynch. I might be in the minority, but I think the development of Seattle’s offense, as a whole, will only mean good things for Lynch. I ranked him at number 2, but my fellow writers placed him in the 6 to 8 range. You will also see that Foster is ranked as the 5th best back. Much of this has to do with his use in 2013. So again, he’s right where he should be. The group seemed pretty divided on where Darren Sproles should be ranked. Sal Stefanile gave him a number 12 rank, Austan didn’t even give him an RB2 grade. I think this is pretty reflective of the entire fantasy football community, as I’ve seen a lot of varying opinions regarding Sproles in 2013. I personally see him as an RB2 option, even in standard leagues. There are a couple of important rookie rankings that I would like to point out as we move lower on the list. As a group, the staff ranked Jonathan Franklin (just barely) ahead of Eddie Lacy. And Zac Stacy, the rookie back in St. Louis, is the highest ranked Rams running back. The Franklin move looks to be due to Lacy’s injury concerns, and Stacy seems to be a favorite with Isaiah Pead’s Week 1 suspension. Chad Scott broke the mold when he ranked BenJarvus Green-Ellis at number 40. No other writer ranked him worse than 33, and some saw Green-Ellis as a really nice flex option. While BJGE might not be anything special, he gets the job done. And while Giovanni Bernard looks to be the running back of Cincinnati’s future, I don’t think Bernard will take over immediately. Green-Ellis should still see some volume in Cincinnati, at least over the first half of the season.